Even though these rice-crusted catfish filets look like they are deep fried, they actually pan fried. In fact, you only need 1/2 cup of oil and a 12 inch skillet to pan fry four catfish fillets to a lovely golden brown color. You will need at least two hours before frying the catfish, but it's all down time. First, you marinate the catfish in a buttermilk, garlic, and lemon zest mixture for at least an hour. Next, once you've dredged the fish in the cornmeal and rice mixture, you will need to refrigerate the filets for another hour. This step will assure that your dredge will remain on the fish during the frying process. I used this quarter sheet pan and cooking rack combination to refrigerate the fish (affiliate link). The quarter sheet pan is also great for cooking in my toaster oven, and the cooling rack is also wonderful for cooling loaves of bread. You will need a spice grinder or blender to grind the rice for the coating. I used my favorite spice grinder (in fact, I have two, one for coffee, and one for spices). For the ground rice, I used Uncle Ben's long grain rice. It is par-cooked and doesn't need washing, so there's no need to wait for it to dry. These catfish filets are thin and fry up in just 8 minutes, four minutes per side. They're sweet, moist, and delicious... and crispy crunchy!!! I used flash frozen catfish filets which I thawed overnight in the refrigerator. Then I marinated the catfish in the refrigerator for a a few hours before preparing them for frying. 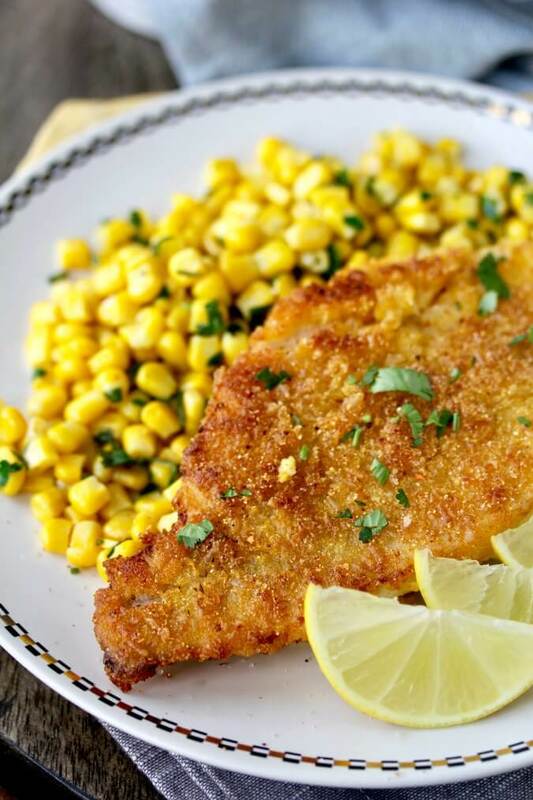 What should you serve with fried catfish? 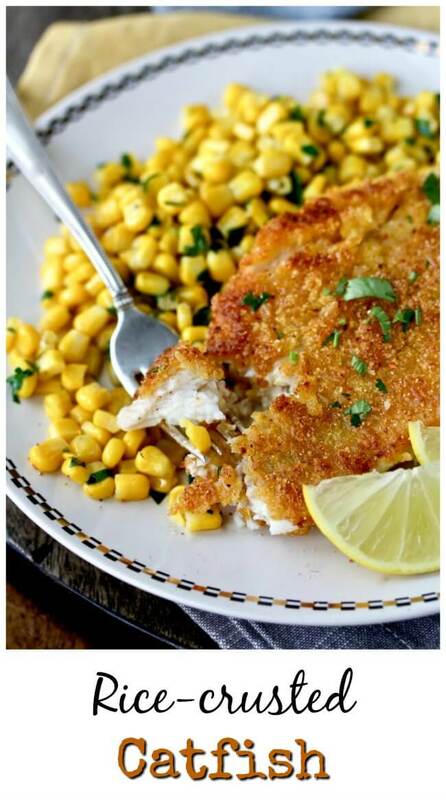 I served this cornmeal and rice crusted catfish with buttery cilantro-lime sweet corn, which was delicious. 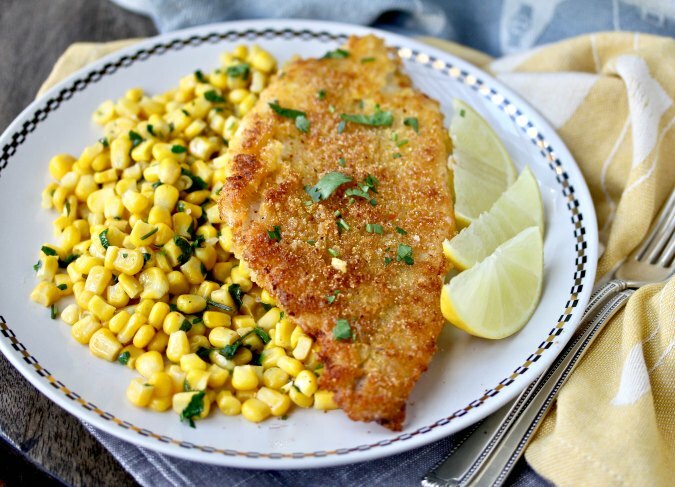 To make it, just sauté 12 ounces of sweet corn kernels (fresh or frozen) with two tablespoons of salted butter, a couple of dashes of cayenne pepper, a squeeze of lime juice, and a handful of chopped cilantro. You can also serve this catfish with hush puppies, coleslaw, greens, succotash, or Cajun rice. If you like catfish, be sure to check out this braised catfish fillets with ginger and soy recipe. It's fast and easy, and totally delicious. If you are interested in southern food, be sure to check out this post for a BLT Sandwich with pimento cheese. This is where I discovered how delicious pimento cheese is! Finally, if you are a fan of whole fried fish, you'll love this Crispy Tilapia with Ginger-Scallion Sauce. Don't let the eyeballs freak you out. Welcome to Progressive Eats, our virtual version of a Progressive Dinner Party. Each recipe in our menu this month features food from the South. If you're unfamiliar with the concept, a progressive dinner involves going from house to house, enjoying a different course at each location. With Progressive Eats it’s a virtual party. A theme is chosen each month, members share recipes suitable for a delicious meal or party, and you can hop from blog to blog to check them out. Come along and see all of the delicious dishes from the South! In a shallow casserole dish, whisk together the buttermilk, garlic, lemon zest, and 1 teaspoon of the salt. Add the catfish in a single layer so that it is completely submerged. Cover with plastic wrap and refrigerate for at least an hour and up to overnight. In a spice blender, grind the rice until it is like coffee or coarse cornmeal. Place it on a plate and add the cornmeal, 1 teaspoon of salt, and the cayenne pepper. Mix with your hands to blend the ingredients. Place a cooling rack on a sheet pan. Remove the catfish from the buttermilk mixture and let any excess liquid drip off. Dredge the catfish in the rice and cornmeal mixture and place each piece on the cooling rack. Refrigerate uncovered for at least one hour. Prepare a large plate with paper towels. Heat the oil in a 12 inch heavy skillet (such as cast iron) over medium heat. To test the oil, drop a piece of the breading into the hot oil. If it sizzles, the oil is ready. Lay the fish pieces into the frying pan and fry on one side for 4 minutes. Gently turn the the fillets over and fry for an additional four minutes. Drain on the paper towel lined plate. Garnish with lime slices and serve immediately. Leftovers can be reheated in a toaster oven or the oven for about 10 minutes at 350 degrees F.